Egyptian food consists some local culinary traditions in it, cuisine of Egypt makes a heavy use of the vegetable and legumes such as rich Nile and Delta of Egypt produce a large quantity of some high quality crops. Meat is also in Egyptian cuisine but it is used in less prominent. 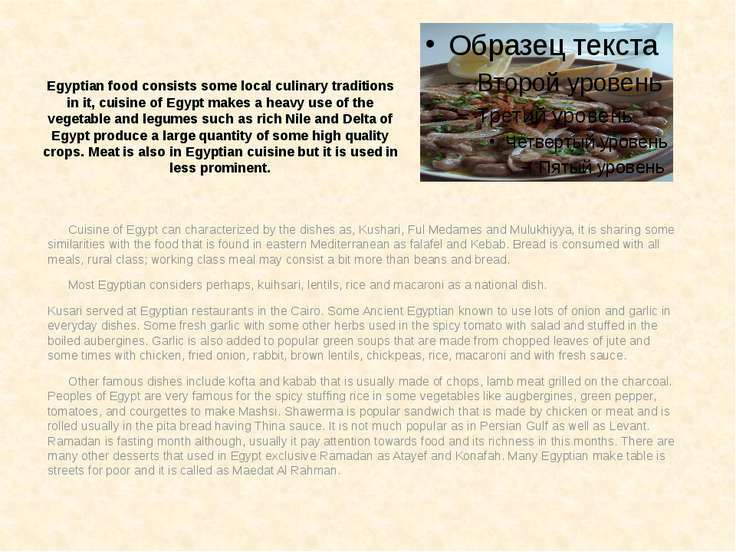 Cuisine of Egypt can characterized by the dishes as, Kushari, Ful Medames and Mulukhiyya, it is sharing some similarities with the food that is found in eastern Mediterranean as falafel and Kebab. Bread is consumed with all meals, rural class; working class meal may consist a bit more than beans and bread. Most Egyptian considers perhaps, kuihsari, lentils, rice and macaroni as a national dish. 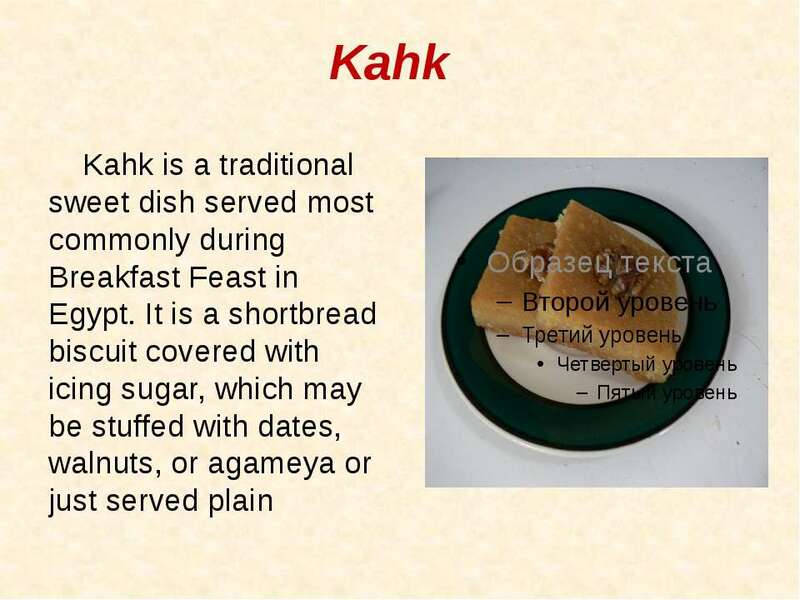 Kusari served at Egyptian restaurants in the Cairo. 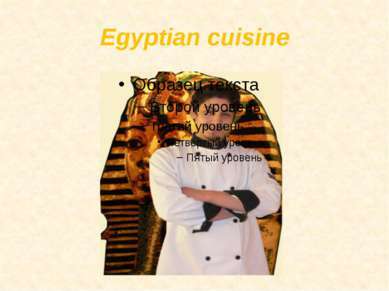 Some Ancient Egyptian known to use lots of onion and garlic in everyday dishes. Some fresh garlic with some other herbs used in the spicy tomato with salad and stuffed in the boiled aubergines. Garlic is also added to popular green soups that are made from chopped leaves of jute and some times with chicken, fried onion, rabbit, brown lentils, chickpeas, rice, macaroni and with fresh sauce. Other famous dishes include kofta and kabab that is usually made of chops, lamb meat grilled on the charcoal. Peoples of Egypt are very famous for the spicy stuffing rice in some vegetables like augbergines, green pepper, tomatoes, and courgettes to make Mashsi. Shawerma is popular sandwich that is made by chicken or meat and is rolled usually in the pita bread having Thina sauce. It is not much popular as in Persian Gulf as well as Levant. Ramadan is fasting month although, usually it pay attention towards food and its richness in this months. There are many other desserts that used in Egypt exclusive Ramadan as Atayef and Konafah. Many Egyptian make table is streets for poor and it is called as Maedat Al Rahman. Kothari Kothari is a popular traditional Egyptian national dish. It consists of a base of rice, brown lentils, chickpeas, macaroni, and a topping of Egyptian garlic and vinegar and spicy tomato sauce (salsa). Fried onions are commonly added as a garnish. 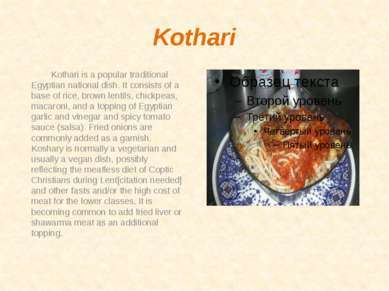 Koshary is normally a vegetarian and usually a vegan dish, possibly reflecting the meatless diet of Coptic Christians during Lent and other fasts and/or the high cost of meat for the lower classes. It is becoming common to add fried liver or shawarma meat as an additional topping. 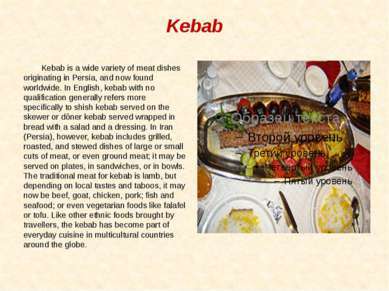 Kebab Kebab is a wide variety of meat dishes originating in Persia, and now found worldwide. In English, kebab with no qualification generally refers more specifically to shish kebab served on the skewer or döner kebab served wrapped in bread with a salad and a dressing. In Iran (Persia), however, kebab includes grilled, roasted, and stewed dishes of large or small cuts of meat, or even ground meat; it may be served on plates, in sandwiches, or in bowls. The traditional meat for kebab is lamb, but depending on local tastes and taboos, it may now be beef, goat, chicken, pork; fish and seafood; or even vegetarian foods like falafel or tofu. Like other ethnic foods brought by travellers, the kebab has become part of everyday cuisine in multicultural countries around the globe. 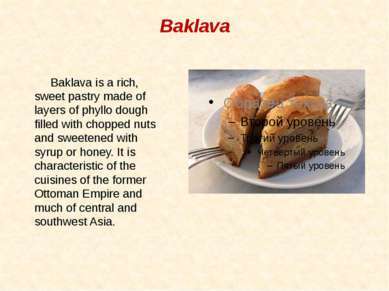 Baklava Baklava is a rich, sweet pastry made of layers of phyllo dough filled with chopped nuts and sweetened with syrup or honey. It is characteristic of the cuisines of the former Ottoman Empire and much of central and southwest Asia. 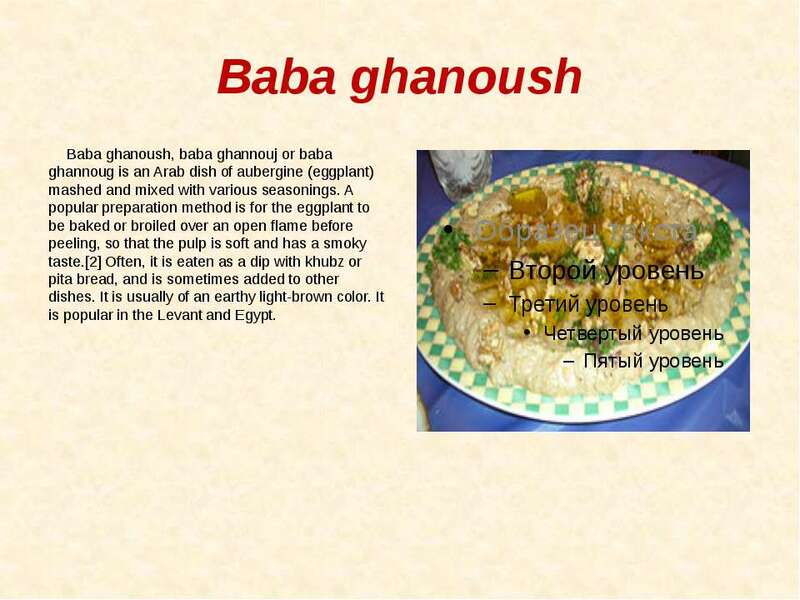 Baba ghanoush Baba ghanoush, baba ghannouj or baba ghannoug is an Arab dish of aubergine (eggplant) mashed and mixed with various seasonings. A popular preparation method is for the eggplant to be baked or broiled over an open flame before peeling, so that the pulp is soft and has a smoky taste. 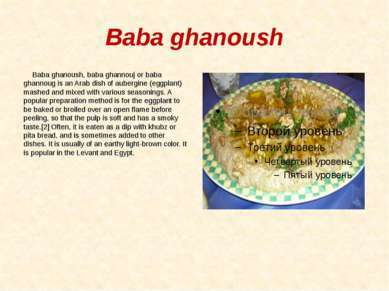 Often, it is eaten as a dip with khubz or pita bread, and is sometimes added to other dishes. It is usually of an earthy light-brown color. It is popular in the Levant and Egypt. 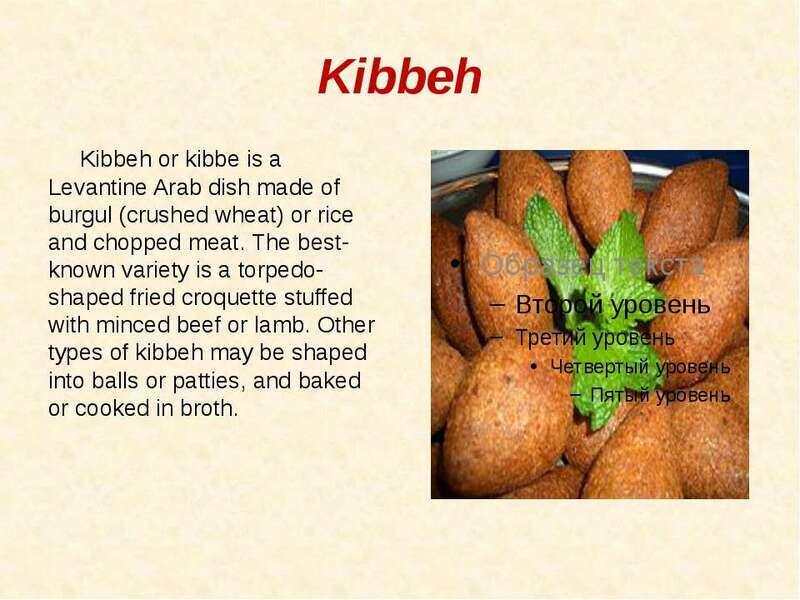 Kibbeh Kibbeh or kibbe is a Levantine Arab dish made of burgul (crushed wheat) or rice and chopped meat. The best-known variety is a torpedo-shaped fried croquette stuffed with minced beef or lamb. 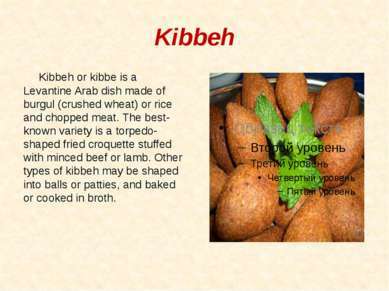 Other types of kibbeh may be shaped into balls or patties, and baked or cooked in broth. 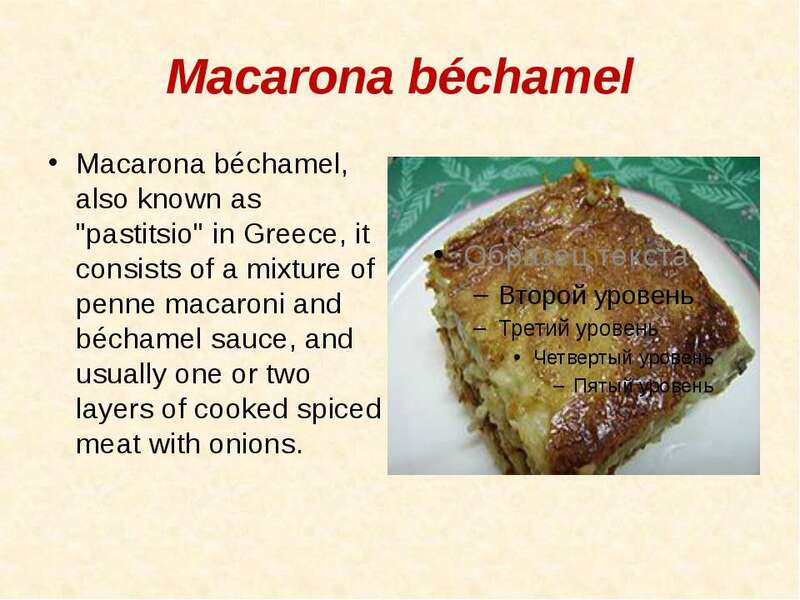 Macarona béchamel Macarona béchamel, also known as "pastitsio" in Greece, it consists of a mixture of penne macaroni and béchamel sauce, and usually one or two layers of cooked spiced meat with onions.